1. On the menu, select File, and then select Print Your Tax Return. 2. On the page that appears, select the link to download a PDF copy of your return. 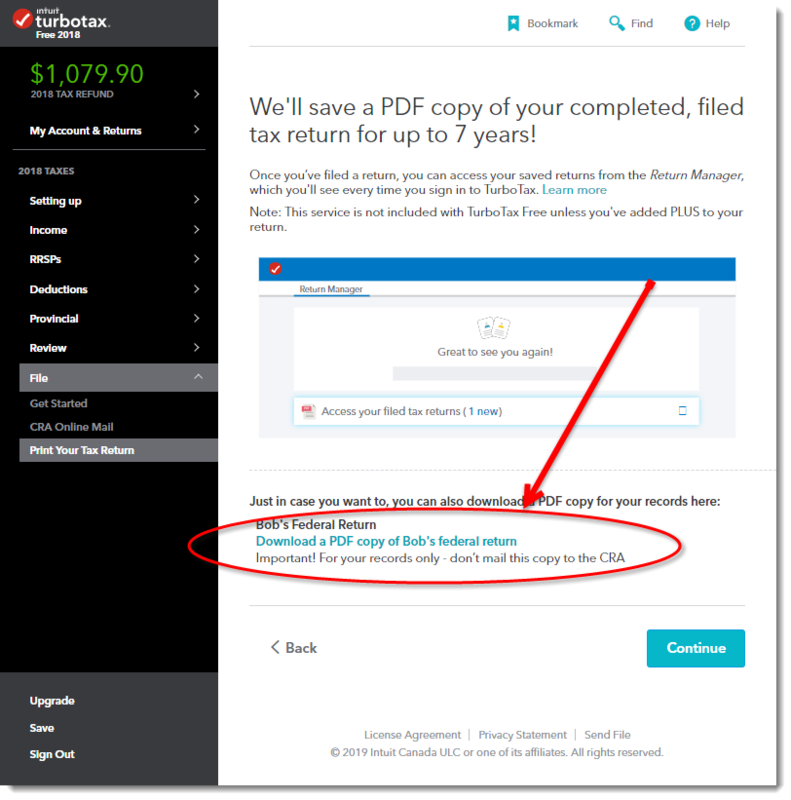 The option to print a tax return is visible only after you pay for that tax return in the online edition of TurboTax. If you filed your tax return, it means you already paid for it. You only need to pay once. In other words, if you don’t pay for a particular tax return, TurboTax doesn’t give you access to the print option for that tax return. After you pay, the File menu lists the print option. If you haven’t paid for the tax return that you want to print, before continuing with the instruction below, pay for your tax return. You can print your tax return at any level of completeness. You don’t need to complete it or file it with the CRA before you can print it. However, you might prefer to print your tax return after you are confident that it is complete. To be certain that your tax return is complete, print your return after you have completed the Review step. It is best to print your tax return after you have submitted it to Canada Revenue Agency (for example, after you use NETFILE). TurboTax Free for the current or previous tax year (2018 or 2017): You don’t have to pay to be able to print your tax return, but you still have to go through the payment section to get to the print option. TurboTax Free for tax year 2016: Refer to the following FAQ to find out how to print your tax return: How do I print my tax return in the online edition of TurboTax Free for tax year 2016? Depending on the tax return you need to print, if you aren’t already signed in to TurboTax, sign in to the year of the tax return that you need to print. For the current tax year (2018): On the menu, select My Account & Returns, and then select View all tax returns. For tax year 2017 or prior: At the upper-right corner of TurboTax, select Tools, and then select Return Manager. On the page that lists all the tax returns, to open the return that you want to print, select Continue.TurboTax displays the page where you left off the last time you used TurboTax. For the current tax year (2018): On the menu, select File, and then select Print Your Tax Return. For tax year 2017 or prior: On the horizontal navigation bar across the top of your TurboTax page, select File, and then select Print Your Tax Return.The navigation bar is visible only if you completed at least the Intro (personal information) and the Profile steps. If you don’t see the Print Your Tax Return option on the menu, you need to pay for your tax return. Tax year 2016: If the navigation bar is not visible on the page you’re on, move through the steps until you get to a step that has the navigation bar. A page appears with a link to download your tax return. Select Download …<First-Names>'s Federal Return.A PDF copy of your tax return downloads to your device. To print your tax return, open the downloaded file in a PDF viewer (for example, Adobe Reader).If you don’t have a PDF viewer installed on your computer, you can download and install Adobe Reader. In your PDF viewer, select the File menu, and then select Print.The Print dialog opens. Complete the instructions on the Print dialog to print out your tax return. How do I print or save my tax return in TurboTax Free for tax year 2016 after I have filed my tax return using NETFILE? In TurboTax Free for tax year 2016, how can I print my return so I can snail mail it to the CRA?